On October 26th I sat in on a webinar put on by Every Day Counts as part of their Smarter Work Zones series. It included four very good speakers: Todd Peterson of FHWA, Jerry Ullman of TTI, Ted Nemsky of Illinois DOT and Chris Brookes of Michigan DOT. Each of them explained their own recent experience using queue warning systems. They described how they used the systems and why. They talked about contracting methods. And they even shared some data. That was one of the “take-a-ways” for me – that there is finally data available that provides strong support for the use of these systems. But we have even more coming very soon. Let’s talk about what we do have. As mentioned here in earlier posts, Jerry Ullman of the Texas Transportation Institute has the most comprehensive results. After more than 200 deployments he found that queue warning systems reduced end of queue crashes by 18% to 45% when used at locations where queuing is expected. These systems also significantly reduce crash severity as well. 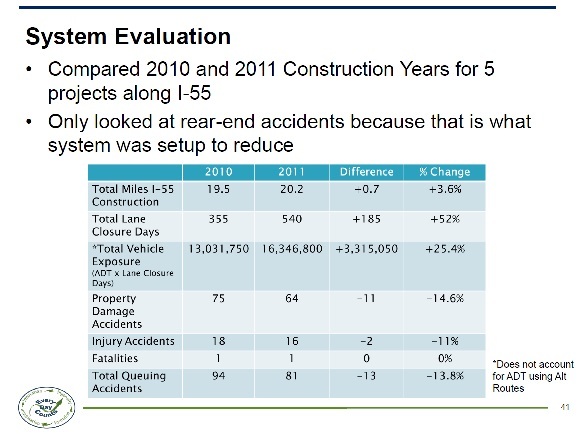 On I-35 they estimate that it reduced crash costs by $6,600 to $10,000 every night it was used! Ted Nemsky also shared some interesting results. They had major construction projects on the same section of interstate in back to back years. The first year was done without a queue warning system and the following year included queue warning. While the number of lane closure days in the second year increased by 52%, end of queue crashes were reduced by 13.8%. Chris Brookes told us the latest Michigan project has collected data prior to the start of work and plan to compare that to the results using their queue warning system. It is still early but anecdotal evidence suggests results similar to those in Texas and Illinois. Another subject I found interesting in the presentations was the fact that no two DOTs chose the same trigger speeds for their systems. Illinois used 55 for slow traffic messages and 40 for stopped traffic messages. Michigan used 45 for slow traffic and 15 for stopped. Part of this is due, I believe, to the culture of each organization. All want to prevent crashes, but some are more concerned with “false alarms” than others. The trigger speeds will also vary somewhat with the application. Some projects justify a more sensitive setting while others are more forgiving. This is a subject we will have to discuss in more detail once we have more data to examine. Chris Brookes mentioned the importance of placing portable changeable message signs on both sides of the roadway. These are queue warning systems, so as traffic backs up truck traffic is more likely to block drivers’ views of message boards on the shoulder. Adding a second one in the median makes a big difference. The systems discussed all used doplar radar and tied system reaction to average speeds. David Rush of Virginia DOT asked Jerry Ullman if the same thing could be done using INRIX probe data. Mr. Ullman said he has heard some discussion of this idea but said you would need more granular data for it to work well. The webinar was full of new, useful information. We already know queue warning systems are here to stay. But they have now been around long enough to produce some very helpful data. And that can only result in far greater use of queue warning systems in the years to come.